Sweetluck Insan (born on August 22, 2007 ) from Sirsa, Haryana, India recalled 100 to 1, reverse counting in shorted time(34.3sec), at Sirsa on August 14, 2015. Rev. 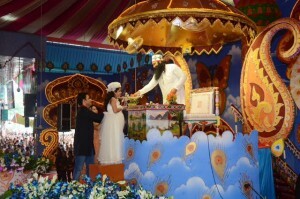 Saint Gurmeet Ram Rahim Singh Ji Insan (her maternal grandfather) Chief Patron of Dera Sacha Sauda, Sirsa guided and coached her for this performance. Comments for FASTEST REVERSE COUNTING 100 TO 1 are now closed.